Hot Rodders Unite … Let’s Go Cruising! BUT, since they are all people much more normal than me, I need to keep their personalities intact but sprinkle some chili pepper on them to create adventures of which they become an integral part. While driving coast to coast and border to border twice in one year, I had plenty of time to think about some crazy adventures that one might get into with an old hot rod car. Like the time in my salad days when my girlfriend lost one earring while parked in my ‘40 Ford coupe, then hid her other earring under the dash. That resulted in the time as a senior business man in Germany 40 years later the same car, with the earring intact, shows up under very bizarre circumstances. With my beer-addled brain, I challenge a hateful old Nazi to a very dangerous race using the ’40 Ford. The Bahnburner as created by BMW engineers became the buzz of Germany! In the six adventures revealed in The Bootlegger ’40 Ford, you will visit exotic locales and go forward and back in time. There is a lot of fact-based content and rest-assured, you are presented with accurate technical detail. My background as an engineer and car restorer plus a world traveler guides my thoughts as I write. There is much truth and much fiction and many friends–male, female young and old–who get wrapped up in these adventure. 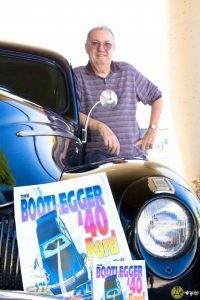 I’m honored that car illustrator Darrell Mayabb created the cover art and illustrated the interior of The Bootlegger ’40 Ford and that race car driver Bobby Unser provided the “insider tip” on how to win the dangerous race. You’ll have to read the story to discover the intrigue, the suspense and what happened! Come join them. And me.